Downtown Boston real estate commissions: Simply Explained! Being a Boston downtown real estate agent is definitely not on anyone’s list of jobs for a regular, predictable income. That’s because we don’t earn a salary. No regular pay days, no holiday bonuses, no raises based on performance. It’s true – Boston downtown real estate agents typically make their living only from commissions, or a percentage of the price of the Boston condo sale they help their client buy or sell. 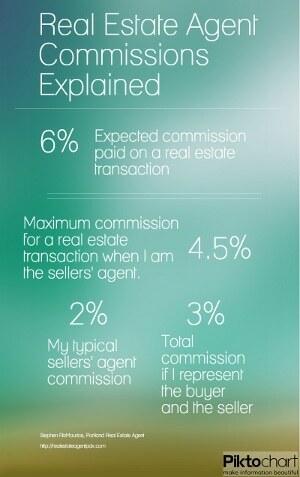 Does it make sense to shop around for a real estate agent with a lower rate? The answer is, absolutely. All Boston downtown real estate commissions are negotiable. It’s still your money, and as a Boston downtown listing broker, I am proud to offer a reasonable commission rate to my Boston condo clients. Most of my clients selling a home or property end up paying a total of 5% commission to list their home – that’s 2.5% for myself and 2.5% for the buyer’s agent. And as a buyers’ agent, I give back portion of that fee back to YOU the buyer. So what does your money buy when you enlist the services of a downtown Boston real estate agent? If you’re looking for a home or property, your buyers’ agent will help you find one that meets your needs. For those looking to sell, a sellers’ agent will list your property on the Multiple Listing Services (MLS) system. the internet and other forms of marketing. This is where the commission based system starts to make sense. There is a lot more a buyers’ or a sellers’ agent can do for their clients, from providing information on potential neighborhoods to holding open houses to bringing buyers to your listing, and advertising your property online in such a way that achieves hundreds of thousands of views. It may seem like common practice, but really, it’s all optional. So choose wisely and ask questions to find out if your Boston downtown real estate agent will work stridently on your behalf, or simply sit back and wait for something to happen. Although my commission rate is low in 2019, I plan to make up for it in the number of transactions I’ll complete this year.